Yesterday we discovered the absolute perfect recipe for fun. I do believe this is a recipe we will be mixing up alot this summer! 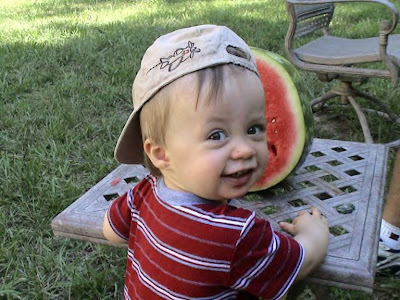 One of my favorite memories from my childhood is eating watermelon during the summer. My Daddy would pick a big, sweet watermelon ... cut it in half longways ... he'd cover one of the sides with a towel and put it in the refrigerator. The other half he and I would take outside with our spoons and salt shakers. We'd sit on the picnic table and enjoy it together. Spooning out this delicious sweetness, dashing it with a bit of salt ... yummmm!! Gosh, that brings back memories. So ... the other day I thought Griffin and I could enjoy some watermelon goodness together. Mike was kind enough to cut it up for us. We headed outside to our quilt set up where Mike is working and I was ready for our son to love watermelon as much as I do. Well ... it didn't work out exactly as I thought it would. He wouldn't even pick it up! I begged and pleaded (as you know this was realistically just a photo op) ... and finally he picked it up. He would never take a bite ... but hey ... I got a couple of dang cute pictures out of it right? The critters in the woods enjoyed Griffin's piece ... and I enjoyed my piece of sweet, delicious watermelon. Sigh. Memories. It's funny how Griffin goes through stages playing with certain toys. He's had this wagon of mega blocks for quite a while. He hasn't touched them in months and then the other day he pulled them out and started playing with them. Seriously ... this post is a year in the making. I've been meaning to post about our visit to Chincoteague & Assateague Island for almost a year now ... and now I'm finally doing it. In August of last year, Mike's mother was visiting to help us celebrate Mike's 40th birthday. We knew we wanted to do something special, but we just weren't quite sure what that was. We decided to get in the car and just drive. We really didn't have a destination set ... we just knew when we got there, that's where we would be. We did think we might end up on the coast of Maryland. Finally, we started seeing signs that said we were getting close to Chincoteague. I said ... hey isn't that where the wild horses roam? That's pretty much all I knew about the place. My mother-in-law Bett loves horses, so we decided to see if we could find a room there. Well, let me just say, that was no easy task. On the entire island there seemed to be only one room available. The Presidential Suite in one of the hotels was all that was left. Mike said we should just do it ... let's just say the cost of the room was VERY presidential. It was nice though ... right on the water, balcony all around, jacuzzi, HUGE room. If you would like, you can click on any of these pictures to see them in a bigger view. This is a picture of us on the drive ... we stopped off at a rest area that was over the water. It was beautiful! As you can see Griffin had no interest in looking at the camera. It was all about looking at the boats for him. I had never seem a ship like this before. Wait ... maybe I have in Tampa Bay ... I don't remember. But it was HUGE!! The first night we were there, we ate at a place called Steamers. Okay ... let me just say ... it was SO good. And what is a post from me without a picture of food, right? After dinner, Mike and Griffin went back to the room and Bett and I went for a walk. Here we are in front of a statue of the famous "Misty of Chincoteague". The Chincoteague Pony was made famous by Marguerite Henry’s 1947 children’s novel Misty of Chincoteague, and the subsequent sequels Sea Star: Orphan of Chincoteague, Stormy: Misty’s Foal, and Misty’s Twilight. The real Misty of Chincoteague was born on Chincoteague in 1946, and her descendants still serve as ambassadors of the breed. And here we are entering the seashore area ... I didn't take pictures of the beach. It was what I would say looks like a lake shore ... not really beachy at all to me. And I just LOVE this picture of Mike and Griffin walking along the path that would lead us to where the wild horses and ponies were. It was quite a hike there, but we finally made it!! We did see the wild horses, they were way off in the distance. I was a little surprised there were condos in the distance too. From what I hear, many times the horses can actually be seen on the beach. Here's a little history lesson for you. There are two theories of how the ponies came to live on Assateague Island. The legend is that a Spanish galleon wrecked off of Assateague Island and the surviving ponies swam to the island. However, the more likely theory is that early 17th century colonists let their animals loose on the island to avoid the tax on fenced livestock. Whichever theory is true, the free-roaming ponies of Assateague have been living there for hundreds of years. The Virginia feral ponies are owned by Chincoteague Volunteer Fire Department. The government allows the fire department to keep a maximum of 150 adult ponies in the Chincoteague National Wildlife Refuge on Assateague Island. For over 80 years, on the last consecutive Wednesday and Thursday in July, Pony Penning is held on Chincoteague. The herds on Assateague are rounded up, and on Wednesday of Pony Penning week the ponies swim from Assateague to Chincoteague. The ponies are held in a pen at the carnival grounds on Chincoteague until they swim back on Friday morning. On Thursday, an auction of most of the foals is held with a few kept as future breeding stock. The proceeds of the auction are used to care for the feral ponies and finance Chincoteague’s fire department. A second roundup is held in the fall for a vet check, an informal sale of the foals born after Pony Penning, and the foals sold in July that were too young to be weaned are picked up by their owners. If you ever have a chance to visit ... I highly recommend Chincoteague. It's a quaint, beautiful place for families. First ... I'm so excited to share that my sister-in-law Bonnie is now blogging!! If you have a moment, please visit her blog and say hi. or you can click on her link to the right labeled Bonnie. As I have mentioned before, Mike is on vacation this week and he's working on the house addition. This little guy is so happy about having Daddy at home for a whole week ... he's being Daddy's big helper. The addition that Mike is adding on to our house is very tall. To reach certain areas, he has to rent a lift to reach them. Here he is painting the tallest point. Since Mike needs my help ... I have to find a way to keep Griffin in the backyard, so we can keep an eye on him. Fort Griffin (his playset) is really out of eye shot, so if I want him to stay in the backyard with us I have to be creative. I drug all of these toys in the backyard ... and guess what he chooses to play with instead??? The down spout ... all of these toys to play with and he chooses to play with the down spout ... go figure. The next few pictures are of our little country boy ... well, just being a country boy while we are outside working. This is one of his favorite things to do ... ride the lawn mower. Mike had the lift all weekend ... and Griffin asked several times for a ride. Mike promised he would take him for a ride before he loaded it up to take it back. And here are my two boys "up in da sky" as Griffin would say. He was so cute, holding on tightly to the saftey bar just as Daddy instructed him to. He's such an adventurous soul. We had a really nice Memorial Day weekend. I'm so looking forward to being at home with my sweet boys this next week. I'm hoping to be able to post every day ... but if I miss a day here and there this next week, please understand I'm spending some quality time with my family. I thought I would share one more picture from the past. This is Griffin July 4, 2005. He was almost five months old. 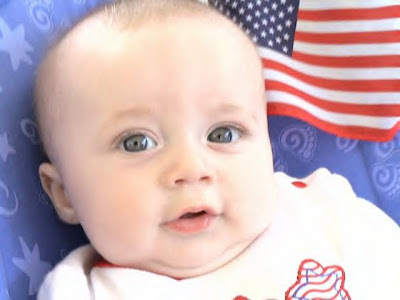 He was dressed in his red, white and blue and proudly displaying his flag. "This Memorial Day, I ask all Americans to honor the sacrifices of those who have served you and our country. One way to do so is by joining in a moment of remembrance that will be marked across our country at 3:00 p.m. local time (eastern). At that moment, Major League Baseball games will pause, the National Memorial Day parade will halt, Amtrak trains will blow their whistles, and buglers in military cemeteries will play Taps. You can participate by placing a flag at a veteran's grave, taking your family to the battlefields where freedom was defended, or saying a silent prayer for all the Americans who were delivered out of the agony of war to meet their Creator. Their bravery has preserved the country we love so dearly." Cute Things Griffin Is Saying. I'm in a nostalgic mood lately. I've been searching through the pictures on my computer and I came across this one of Griffin and me. I know it was taken in 2005, however without looking it up, I honestly can't remember the month. 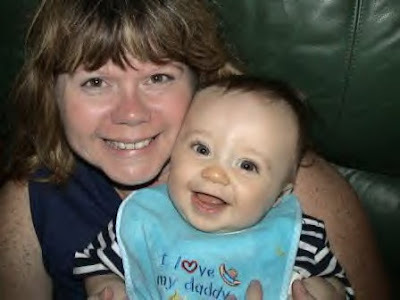 He was at least six months old, as I can see the baby food on his bib. I still had good hair and good skin in this picture, leftover from my pregnancy days ... lol. Griffin has been pretty talkative and funny lately. M: Ummmm .... what did you say???? Oh okay ... I got it ... he was thinking about his favorite tv show (Hi-5). On the penguin part of the show the baby penguin calls himself baby penguin and he calls his mommy Big Mommy ... he wasn't being disrespectful. Can you imagine what was going through my mind at this point? My son will NOT be calling me Big Mommy or Big Momma. Never. Period. Daddy you funny, that's Mommy's song. Awwwwwww ... I thought that was the sweetest thing!! Mike is officially on vacation beginning today. It's going to be a stay-at-home, work around the house vacation. I'm really looking forward to it!! Well, I hope you all have a fabulous Sunday! A Little Of This & That. I'm in the process of getting ready for a yard sale. About 10 of us local mommies have rented out the Goochland Fairgrounds to have a multi-family yard sale. I'm hoping it will be a nice day. I will have ALOT of scrapbooking stuff, baby boy & toddler stuff, women/men's clothing, collectibles and various knick knacks. If you are in the local area, please join us on June 7th from 8:00 - 2:00 for some great yard sale shopping! I know the other ladies are going to have some really nice things and big ticket items too. And really ... what is a post without a picture? I decided to share one of my all time favorite pictures of Griffin today. This picture was taken the summer of 2006. Doesn't he look like a baby? He was only a year and a half old. Gosh, he's growing so fast! If interested in getting addicted ... try it yourself! And this is Memorial Day weekend ... please take the time to remember all of our service men and women, past and present who have served our country. Memorial Day has always been one of my favorite holidays. My Dad was a veteran of World War II and he proudly waved his US Flag on this day every year. It gives me great pride to follow in his footsteps by waving our stars & stripes too. I have to say, everytime I see a flag it reminds me of my Daddy ... it just makes me happy. Great Dinner & A Small Fry. About a month ago, Mike got a new grill ... and I'm loving it as much as he is! We had a grill, but it was a charcoal smoker and it seems to take forever to grill anything. Now with this grill ... it takes hardly anytime at all. Last night I was prepared to make a garlic herb pork loin in the oven along with some rosemary red potatos and onions. Instead of cooking them in the oven, Mike suggested he cook them on the grill. Here's grill master Mike with his awesome new grill ... it even has a searer and an oven. And these next two pictures are for my friend Heidi ... she thinks it's funny that I take pictures of food. But c'mon ... don't these rosemary potatos look yummy??? And this pork loin was sooooo good ... tender ... juicy ... cooked to perfection! It's actually a Smithfield product ... Paula Deen's picture was on the package, so you know I had to get it! Do you see that tiny little black speck on the bottom right of the ph tester? Just ignore the algae growth ... well, folks that is a small fry. It's a tiny little black fish. We've had the aquarium since February and I think this is probably the third time I've seen baby fish. But as you know "survival of the fittest" takes place and normally the fry do not survive. Well, this little guy is holding his own. Yesterday afternoon he worked his way into the gravel on the bottom of the tank. And this morning he was swimming around the plants. I'm hoping he makes it. Well ... I hope you all have a wonderful Memorial Day weekend. Yesterday we were pleasantly surprised to receive an unexpected package in the mail from Uncle Jerome and Aunt Bonnie (my brother and sister-in-law). Mmmmmmm ... what do we have in here???? Oh my goodness ... look at these great surprises!! Griffin received this really cool "Just Mow It" John Deere t-shirt, Vehicle/Airplane Tubby Toys, and there was also a darling squishy teddy bear pillow in the package. I'm pretty sure the teddy bear pillow was meant for me ... but as you can see in this picture, he took complete ownership of it. As a matter of fact he slept with it last night. Thank you Jerome and Bonnie ... your sweet gifts were totally unexpected and very much appreciated! We LOVE you guys!! And ... I've been tagged by Gary to answer these questions. Elmo in Grouchland ... it was on the free movie schedule in 2006. Harley and I took Griffin and he did amazingly well sitting there watching the movie. Griffin saying "I LOVE YOU MOMMY"
8. Do You Sleep With a Stuffed Animal? It depends really ... I love a good hard rain, and after living in Central Florida I'm certainly mostly comfortable with thunder & lightning. But something about the thunder & lightning here in Virginia is different. It's as if the sound gets amplified through the big trees all around our house. 12. If You Could Dye Your Hair Any Color, What Would Be Your Choice? Golden brown with natural looking highlights. Our hardwood floors ... we have a full-wave waterbed and nothing can be under our bed. 15. Would You Like To Be Born As Yourself Again? 16. Morning Person Or Night Owl? Definately a morning person ... when the clock strikes 9:00 pm I am usually asleep. 17. Over Easy Or Sunny Side Up? Neither, I want my eggs scrambled hard. No runny stuff at all for me. 21. Of all the people you tagged this to, who’s most likely to respond first? Well, first I guess I have to tag someone ... so let's see ... I'll tag Cecile ... and if anyone wants to do it, please do!